Some people say extreme beauty can be painful. "Tolerating" immense beauty can make you ecstatic and the experience, blissful; it can make you smile and cry at the same time. There are places on earth where the clock stops ticking, places where the windows of heaven open wide and let the divine light pour in. 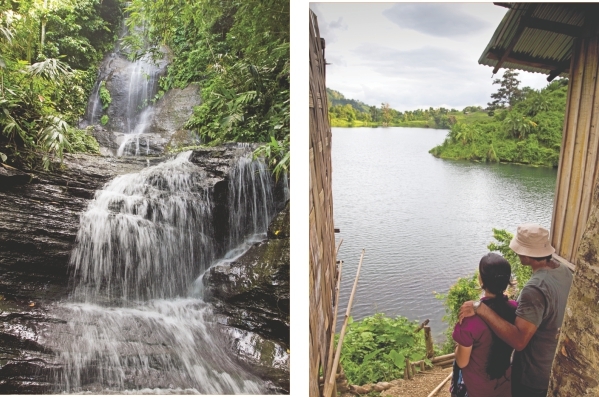 Chittagong Hill Tracts is a gem that seems to have fallen from some long lost, strange heaven. 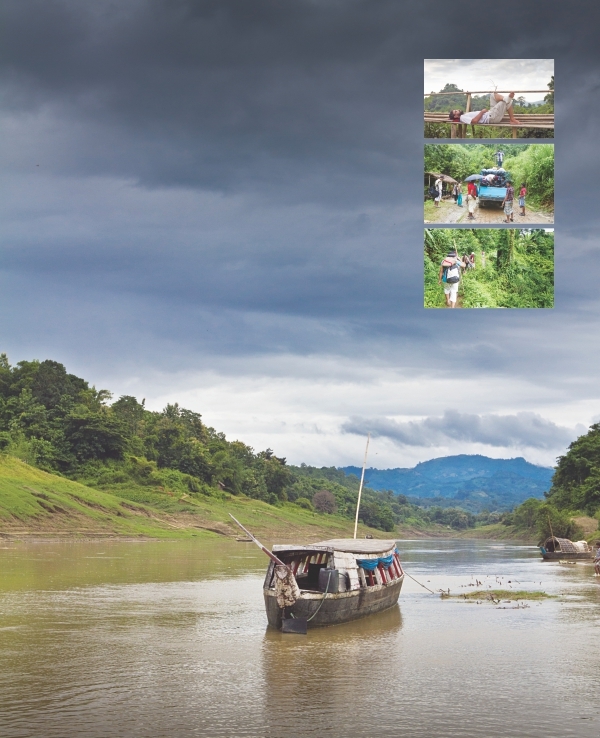 Bandarban is a land flooded with mesmerising greens, whites and spellbinding blues: a heaven crowded only by trees long and small and clouds into which you can walk through at the peaks of mighty mountains that are only shadowed by an even mightier sky. Boga Lake is a beautiful lake that defies all common sense; being the highest hill-enclave lake in Bangladesh, it changes its colours in various seasons. Locals say it used to be the home of dragons. Surrounded with mystery, the place engulfs you with surrealism and calmness beyond your thoughts. 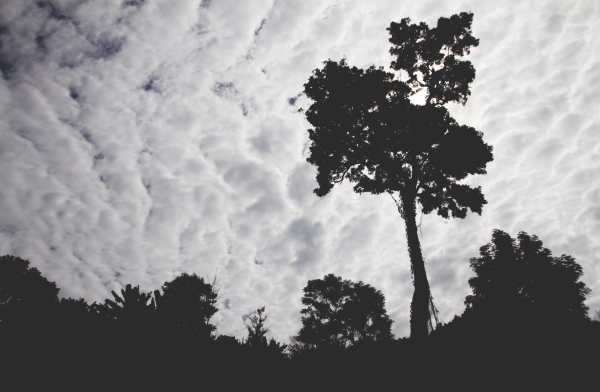 On the other hand, Bandarban is also home to Keokradong, one of the highest peaks in Bangladesh, a mystical place where clouds wander aimlessly. Bandarban is home to the highest mountains in Bangladesh. The way of reaching many of their peaks is through trekking -- indeed, a journey bears adventures, stories and beauties no less great than the destination itself. At one point or another, you feel the place holds all of life's answers, smiling at you, hiding beneath the peculiar harmony of nature and the simplicity of the locals whom you know nothing about. If you want to embark on one of these tours, The Travelers, a tour operator that takes you to awe-inspiring journeys to some of the most beautiful corners of the country, is the answer for you. Their next trip, which is scheduled in December, is the Sundarbans. If you want to embark on one of these epic journeys and adventures, pick up your phone and call 01715026270 or 01755550020, and pack your bag! To pen a eulogy for a mother can never be easy. Where does one start? With so much to write, so many emotions to cover, it is not unnatural that one does not know where to finish either. Husnun Nahar Zaman, my mother, was an extraordinary person. I say this not because she is my mother; all who knew her would vouch for her amiable and loving nature. She never forgot a birthday, an anniversary never went unnoticed. In fact, her brilliant memory was not restricted to remembering important dates only. Even in her last days, her mind was as active as it was in her youth. But I will possibly remember Amma more for her patience and tolerance. She was only ten years old when she lost her mother; third amongst eighteen children, she was left with the task of taking care of her younger siblings along with continuing her own education. She got married at the age of fifteen. My paternal grandmother saw her at one of Amma's school programmes arranged on the occasion of the Independence Day of Pakistan, reciting from the Holy Qur'an. Till her last days she remained a devout Muslim, and loved sharing her knowledge of religion with her children and anyone who showed interest in theology. A proposal was eventually sent to my Nana, Azizuddin Ahmed, former minister of erstwhile East Pakistan and she was married off to Kazi Md Asaduzzaman, my father, then a naval officer. It was with my 'wanderer' father that she had the opportunity to tour many places. My mother always felt that she had learned a lot from her travels, an experience that she lovingly shared with her students, as a school teacher, later in life. Her siblings remember her as the older sister who would design, stitch and embroider dresses for them. In the winter she would make woollen clothes for the entire family. Thinking of the good old childhood days at Khulna Shipyard, every Eid, we found her busy stitching new clothes for all her children or taking care of the upholstery. Every nook and corner of her house would brighten up with her special touch. Her secret recipe for the spicy rezala, the gravy roast or the fragrant Hilsa pulao may be forever gone along with her. She had a wonderful voice. 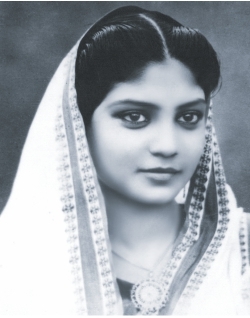 She loved singing songs of Protima Banarjee just as much as she loved reciting poetry. She was also politically aware. Amma was usually the first to inform us of any startling news, be it local/world politics, natural disasters or the gruesome massacre in Oslo. Even after our father passed away when she was 55 years, with her six daughters she continued carrying on ahead with patience, calmness and strong will, in spite of certain odds. Amma with all her qualities and experience was always sought after for advice by all who knew her. She was also sought after for giving names with good meanings to new-borns. She had very sharp eyes and had the rare ability to vividly describe what she saw anywhere. Today, I want to remember late Begum Husnun Nahar Zaman as not only my mother but as a person with a lot of talent and as an excellent human being. All her daughters feel blessed and proud to have had a mother like her and pray that the values she instilled in us continue in our life. May Allah grant her a place in Jannat-ul-Ferdous. Ameen. "My house was neater, calmer but hopelessly empty and I wished for the old, raucous days every minute of those first few days,” reminisces Shireen Khannam, a university teacher by profession, who has bid farewell to the youngest of her three children last year when he set off for university abroad. Shireen's house has gradually lost its bustle over a period of ten years as each of her children left the 'nest' in matrimony or for education. This however did not prepare her for the crashing sorrow she felt when her house became completely empty, devoid of teenage tantrums and sibling squabbles. “I often went into his room and sat on his bed, breathing in the stale boyish smell of the room that I so despised,” Shireen says with a curious smile playing at the corner of her lips, “Thankfully I am now back to despising that smell again,” she jokes. Shireen's story is one which is being played across a great number of houses in our society today. As more and more children set off for university education abroad, mothers in numerous houses are finding themselves 'unemployed', so to speak. Feeling sad and crying a little is a normal, healthy reaction to be expected of any parent as this big change unfolds in their life but unheeded, this can tip into depression and what is universally termed as the 'Empty Nest Syndrome'. The empty nest syndrome is medically unrecognised but that does not make the pain of it any less real. It impacts women in particular because motherhood is a role to which women dedicate themselves for an average of 20 years. It can cause a feeling of redundancy, as if you no longer see a goal to your being and can make you feel unworthy and lost. It can impede relationships with your spouse, your family and the very children who triggered it all. That was of course unfeasible. There are however many modern day communication platforms such as Facebook, Skype and international texting which allows Lisa to be in touch with her foreign-settled children. Lisa, however adds, "It is necessary for parents like me to remember that the children have left the nest to go forward in life and so if they do not reply as frequently as they do initially do not misread this to mean that they have stopped caring." Scheduling a weekly call-in time to the child's convenience and conducting other in-between communications through texting is a probable solution. Whatsapp and Viber are two mobile phone applications which can be handy in such situations. Shireen makes another request to parents in similar situations "Please refrain from pouring your sorrow on your child; they have enough on their plates without becoming anxious about your state of mind." Your child may initially feel quite homesick and if this happens do resist the impulse to be pleased. Do not suggest that they give up and come home and do not solve their problems for them. Allow your little darling to wander off, make mistakes and learn to cope with life. Standing on the sidelines is perhaps the hardest thing you will be required to do as a parent. Empty nest syndrome can be a difficult phase of a woman's life. Do remember however that the mothers of the past had it much worse without the modern means of communication. Today you not only get to talk to your children but see them as well when your heart yearns for it. The best news is, it gets better; time fills the empty space in your heart and you will find new meaning to life again.